She Fought and Died For Women's Suffrage, But Did She Make Her Husband's Tea? Today my message is short, but not so sweet. Summed up in the visual that leads off this blog post. 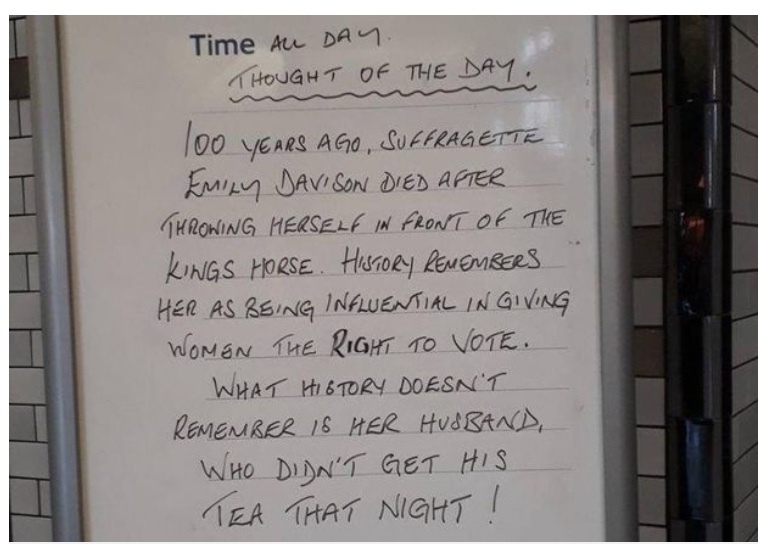 On the day after we explored how sexist descriptions follow women to the grave, somebody at London Transport thought it would be a good idea to perpetuate the notion that women's foremost duty in life is to be sure her husband is served his cup of tea. So let's pause to take in what is closer to the totality of Emily Davison's life, as rendered by The BBC. In 1906, she joined the Women’s Social and Political Union (WSPU), founded by Emmeline Pankhurst. Three years later she gave up her job as a teacher and went to work full-time for the suffragette movement. She was frequently arrested for acts ranging from causing a public disturbance to burning post boxes and spent a number of short periods in jail. In 1909, she was sentenced to a month’s hard labour in Strangeways Prison in Manchester after throwing rocks at the carriage of chancellor David Lloyd George. She attempted to starve herself, and resisted force-feeding. A prison guard, angered by Davison’s blockading herself in her cell, forced a hose into the room and nearly filled it with water. Eventually, however, the door was broken down, and she was freed. She subsequently sued the wardens of Strangeways, and was awarded 40 shillings.